St. Eucherius was from Orleans, France. He was the nephew of Suavaric, Bishop of Auxerre, and he himself was the Bishop of Orleans. Eucherius was led to the monastic life in 714, at the age of 27, after reading the letters of St. Paul to the Apostles. Seven years after entering, Bishop Suavaric of Orleans died. The reputation of his virtue was very well known, and he was begged to accept the vacant See. Despite his dislike of the idea, he did consent to become Bishop of Orleans in 721. Charles Martel had arisen to power and had confiscated the Church’s property to fund his war efforts against the Moorish invasions from Al-Andalus, and since Eucherius had opposed Charles, he found himself out of favor with the new dynasty. When Charles returned from his victory at the Battle of Tours, he stopped in Orleans and exiled Eucherius to Cologne. He retired to the Monastery of St. Truiden, where he spent the remainder of his life in prayer and contemplation until his death in 743. He died in Cologne, Germany. Hincmar of Reims reported to a Council of Quierzy in 858, a vision that Bishop Eucherius of Orleans had seen during the reign of King Pepin III over a century before. While at prayer, Eucherius had been taken up and shown, among other things, the sufferings of those in hell, among whom he saw Charles Martel. When the vision ended, he called St. Boniface and Fulrad, the Abbot of Saint – Denis, and asked them to see if Charles Martel had died. When the two opened the tomb, a dragon rushed out, and they found the tomb’s interior blackened as though burned. These two signs were taken as evidence that the vision had been accurate and that Charles had been condemned to hell for his confiscation of Church property. 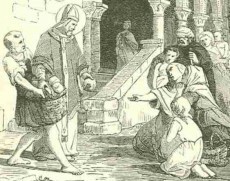 St. Eucherius was born in Orleans, France. He was the nephew of Suavaric, Bishop of Auxerre, and he himself was the Bishop of Orleans. Eucherius was led to the monastic life in 714, at the age of 27, after reading the letters of St. Paul to the Apostles. He was well known for growing in virtue, as well as in knowledge of the faith. He opposed Charles Martel, who confiscated the Church’s property to fund his wars, and was exiled to Cologne. He remained there until he died, staying at a Monastery in prayer. He had a vision that Charles Martel was condemned to hell for his confiscation of the Church’s property, and when Charles’ tomb was opened, the tomb’s interior has been blackened, as though it had been burned.